The Alameda County Superior Court is the California Superior Court located in Oakland, California with jurisdiction over the entire Alameda County. The original courthouse was established on June 6, 1853 in Alvarado, California (a part of present-day Union City). After the county seat moved to Oakland (first to San Leandro), a new courthouse was built in 1875, locating near Oakland's Washington Square. 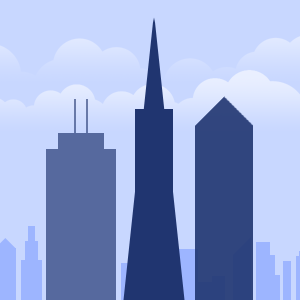 The Encinal Tower is a skyscraper proposed for construction in Downtown Oakland, California. The mixed-use tower is planned to rise 715 feet (218 m) and contain 56 floors for office and residential use. The current project design consists of a glass and X-bracing-covered cylindrical building with one side that resembles a roll of fabric unraveling. 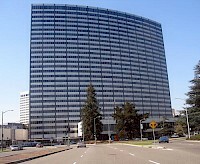 Kaiser Center, (also called the Kaiser Building) is an office building located at 300 Lakeside Drive, adjacent to Lake Merritt, in downtown Oakland, California. The property is bounded by Lakeside Drive (which terminates and joins Harrison Street at the site), 20th Street, 21st Street, and Webster Street. The building has 28 stories and was completed in 1960. At that time, it was Oakland's tallest building, as well as the largest office tower west of the Rocky Mountains.. The Kaiser Engineering Building is a high-rise located in downtown Oakland, California. It has 25 stories and stands at 336 feet (102 m) tall. The Lake Merritt Plaza is a high-rise located in downtown Oakland, California. It has 27 stories and stands at 371 feet (113 m) tall. The building, developed by Transpacific Development Co., is designed by architect Bill Valentine. In 2006, TDC sold it to Boston-based Beacon Capital Partners for $160 million. 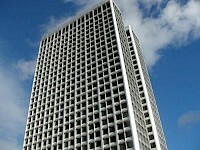 The Ordway Building (also known as One Kaiser Plaza) is a skyscraper located in downtown Oakland, California. 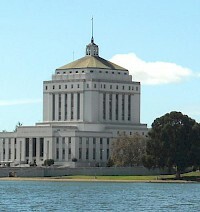 The building lies close to Oakland's Lake Merritt and the tower contains 28 stories of office space. There are eight corner offices per floor, since the skyscraper has a "H"-shaped floor plan. Standing at 404 feet (123 m) tall, the Ordway Building is the tallest skyscraper in both the city of Oakland and in the Bay Area outside of San Francisco. 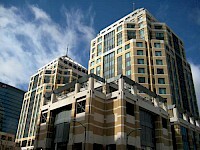 The Ronald V. Dellums Federal Building complex is a federal building complex in Oakland, California, constructed as part of the Oakland City Center redevelopment project. In 1998, the United States Congress passed a bill naming the building for mayor and former Congressman Ronald V. Dellums. It consists of two identical towers topped with pyramid-shaped roofs, echoing similar landmarks such as the Alameda County Courthouse. The Tribune Tower is a 305-ft. (93 m), 21-story building located in downtown Oakland, California. Completed in 1923, the 89,251 sq.-ft. (8,291 sq.-m.) building was opened by Joseph R. Knowland on January 1, 1924, as the home of the Oakland Tribune newspaper, and is a symbol of both the Tribune and the city of Oakland. In 1915, when Joseph Knowland, a former U.S. congressman, acquired the Oakland Tribune, the newspaper was located at Eighth and Franklin streets in the old Golden West Hotel.